In Hear This, A.V. Club writers sing the praises of songs they know well. This week, we’re talking about songs with a cappella interludes. Calling anyone the “greatest” of anything is always asking for trouble. 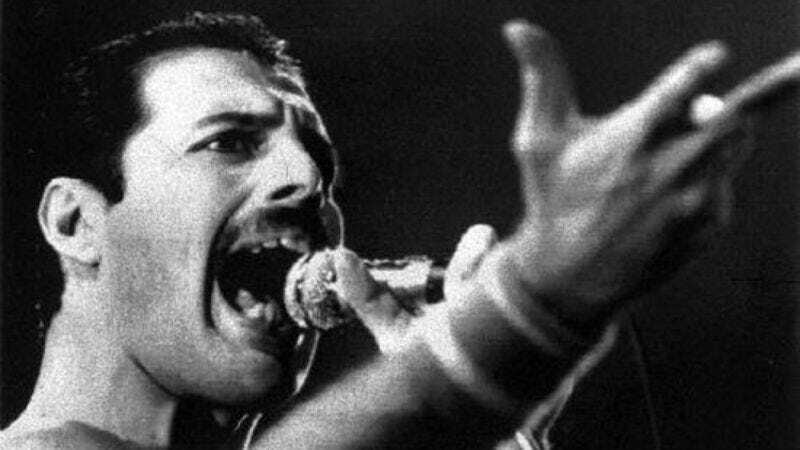 Still, I feel wholly confident in saying Freddie Mercury is the greatest rock vocalist of all time. Zooming past legends like Robert Plant and Mick Jagger, Mercury took vocals to a new level, adding operatic levels of harmonies to the mix. Queen’s other band members were no slouches either. Brian May matched Mercury’s vocal proficiencies on the guitar, and Roger Taylor and John Deacon provided a stellar rhythm section on drums and bass, but it’s the beyond-dynamic frontman you remember most about the band. May, Taylor, and Deacon didn’t even seem to mind. They totally got it. Realizing that its most obvious asset was its singer/pianist/songwriter, Queen took its best songs and pulled the vocals out so the listener could marvel at Mercury’s insane range and unmatched emotional heights. The band’s ’70s heyday offers plenty of examples of these inspired a cappella moments, from “Bicycle Race” to “Fat Bottomed Girls,” culminating with the masterpiece of “Bohemian Rhapsody.” But for Mercury’s definitive performance, I’m going with the lovelorn anguish of “Somebody To Love.” Like Sinatra, Mercury’s emotional phrasing made even his arena-rock hits seem as intimate as the tiniest, saddest piano bar. The song starts with a thin, two-syllable plaintive plea: “Ca-an?” leading to the song’s main query: “anybody find me somebody to love?” “Somebody To Love” finds its author and singer, Mercury, in more of a spiritual mood than usual. Unlike the rock opera of “Bohemian Rhapsody,” the unbridled joy of “Don’t Stop Me Now,” or the anthemic heights of “We Will Rock You,” here Mercury is inspired by more intimate spirituals (specifically the voice of Aretha Franklin, who also knows from emotional music). He despairs of a life without love, and wonders if he will ever be free from this cage of isolation. Where “Bohemian Rhapsody” had a murder, a mother, and no shortage of drama, the loner from “Somebody To Love” actually describes the banality of his day: getting up, going to work (the chorus sticks up for him: “He works hard / Every day”), even as “everybody wants to put me down” and he’s got “nobody left to believe.” The tragedy here is on a much smaller scale, but to the narrator, just as painful, and life-draining. But as the narrator continues to ask God for some guidance, he is backed by Queen’s multi-layered gospel chorus of background vocals, offering the sense that even this lonely soul is not so solitary. This vocal chorus punctuates almost every line Mercury sings, with Mercury, May, and Taylor creating a vocal wall that sounds like 100 voices, thanks to layering track over track in the studio. Even the guitar here is a tad restrained, to focus more on the sadness of the song, letting the vocals take center stage throughout. So the song’s dramatic climax is not one of May’s signature solos, but an a cappella build that starts with “Find me somebody to love,” led only by these plaintive, wanting voices. The plea is eventually backed with handclaps as the crescendo builds, working frantic variations on that same, singular demand. The band backs him up ably, but it’s Mercury’s show as usual, and it’s to his credit as a songwriter and vocalist that someone beloved and surrounded by millions puts this isolated sentiment over so sincerely. You know that question about which band you would travel back in time to catch in its prime? For me, the answer is always Queen, for the chance to hear Freddie Mercury in person. There isn’t even anyone in second place.